^ Fink, Sheri (2018-08-28). "Nearly a Year After Hurricane Maria, Puerto Rico Revises Death Toll to 2,975". The New York Times. ISSN 0362-4331. Retrieved 2019-01-22. ^ a b c d Baldwin, Sarah Lynch; Begnaud, David. "Hurricane Maria caused an estimated 2,975 deaths in Puerto Rico, new study finds". CBS News. Retrieved 28 August 2018. ^ Neely, Wayne (2016-12-19). The Greatest and Deadliest Hurricanes of the Caribbean and the Americas: The Stories Behind the Great Storms of the North Atlantic. iUniverse. p. 375. ISBN 978-1-5320-1151-1. Retrieved 9 August 2018. ^ Dorell, Oren; Nuñez, Atabey (2 November 2017). "Puerto Rico's water woes raise fears of health crisis six weeks after Hurricane Maria". USA Today. Retrieved 3 November 2017. ^ "Dominica: The impact of Hurricane Maria – Disaster Profile – January 2018". ReliefWeb. Assessment Capacities Project. Retrieved 1 February 2018. ^ a b Suliman, Adela. "Hurricane-hit Dominica hurries to prepare for next storm season". ReliefWeb. Thomson Reuters Foundation. Retrieved 1 February 2018. ^ a b "Maria among 2017's retired storm names". Dominica News Online. Retrieved 16 June 2018. ^ a b Luna, Katheryn (September 27, 2017). "Cinco muertos, el resultado del huracán María en RD" (in Spanish). Listin Diario. Retrieved Sep 27, 2017. ^ a b Ferré-Sadurní, Luis; Hartocollis, Anemona (September 20, 2017). "Maria Strikes, and Puerto Rico Goes Dark". The New York Times. Retrieved Sep 21, 2017. ^ "'Despacito' made this neighborhood famous. Hurricane Maria left it in ruins". WREG. September 22, 2017. Retrieved Sep 23, 2017. 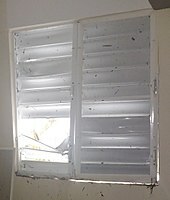 ^ a b "Hurricane Maria Live Updates: In Puerto Rico, the Storm 'Destroyed Us'". The New York Times. September 21, 2017. Retrieved Sep 21, 2017. 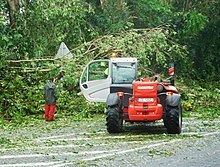 ^ Ferré-Sadurní, Luis (September 22, 2017). "In a Puerto Rican Town, 'Water Came Out of Nowhere'". The New York Times. Retrieved Sep 23, 2017. ^ Jose de Cordoba (September 24, 2017). 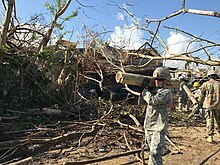 "Puerto Rico Tallies up Devastation from Hurricane Maria". Wall Street Journal. Retrieved Sep 25, 2017. ^ Frances Robles and Luis Ferré-Sadurní (September 24, 2017). 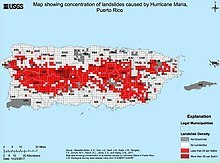 "Puerto Rico's Agriculture and Farmers Decimated by Maria". The New York Times. Retrieved Sep 25, 2017. ^ "Puerto Rico governor: Power could be out for months". CNN. September 21, 2017. Retrieved Sep 21, 2017. ^ Schwartz, Gadi; Johnson, Alex; Arkin, Daniel (September 21, 2017). "All Power Out as Hurricane Maria's Winds, Floods Crush Puerto Rico". NBC. Retrieved Sep 21, 2017. ^ Coghlan, Andy (September 26, 2017). "Thousands of Puerto Ricans evacuated as dam threatens to breach". newscientist.com. New Scientist Magazine. Retrieved Sep 29, 2017. 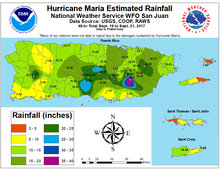 ^ "Puerto Rico's Radar Restored 9 Months after Hurricane Maria's Wrath". The Weather Channel. 2018-06-18. Retrieved 2018-06-27. ^ a b Dooley, Erin (September 21, 2017). "Woman, children rescued from capsized ship near Puerto Rico". ABC News. Retrieved Sep 22, 2017. ^ Drake, Nadiav (September 22, 2017). "Hurricane Damages Giant Radio Telescope—Why It Matters". National Geographic. Retrieved Sep 24, 2017. ^ Kaplan, Sarah (September 22, 2017). "Arecibo Observatory, Puerto Rico's famous telescope, is battered by Hurricane Maria". The Washington Post. Retrieved Sep 24, 2017. ^ "Huracán María: 38 localidades quedan incomunicadas en República Dominicana". El Comercio (in Spanish). September 22, 2017. Retrieved Sep 23, 2017. ^ a b Ian Pannell; Emily Taguchi; Ashley Louszko (October 18, 2017). "'It's all gone': Hurricane-ravaged Dominica, on the front line of climate change, fighting to survive". ABC News. Retrieved Oct 23, 2017. 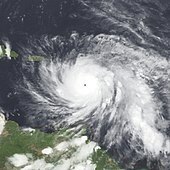 ^ 'To deny climate change is to deny a truth we have just lived' says Prime Minister of storm-hit Dominica (Report). ReliefWeb. UN News Service. September 23, 2017. Retrieved Sep 24, 2017. ^ "Prime Minister Justin Trudeau speaks with Prime Minister Roosevelt Skerrit of Dominica". pm.gc.ca. Justin Trudeau, Prime Minister of Canada. September 22, 2017. Retrieved Sep 26, 2017. ^ a b "Hospital Ship Helps More Puerto Ricans at the Pier than at Sea". The Maritime Executive. Retrieved 9 November 2017. ^ Hernandez, Daniela (19 October 2017). "A U.S. Navy Hospital Ship Was Sent to Puerto Rico—It's Barely Been Used". Wall Street Journal. Retrieved 9 November 2017. ^ "USNS Comfort Restocks to Continue Post-Hurricane Care". U.S. Department of Defense. Retrieved 9 November 2017. 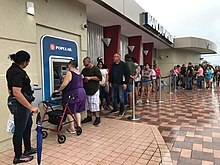 ^ "Puerto Rico population to drop 14% after hurricane". Yahoo.com. 7 November 2017. Retrieved 8 June 2018. ^ "Hurricane Maria Relief". Direct Relief. 2018-02-15. Retrieved 2019-03-22. ^ a b "Puerto Ricans Concerned That $20 Billion Recovery Plan Is 'Not For The People'". NPR.org. Retrieved 2019-01-28. ^ Rogers, David. "Trump White House stonewalls as Puerto Rico aid runs dry". POLITICO. Retrieved 2019-01-28. ^ "Puerto Rico's leaders slam Trump administration for opposing food assistance funding". www.cbsnews.com. Retrieved 2019-01-28. ^ "New Study Estimates Hurricane Maria Death Toll in Puerto Rico Could Exceed 4,000". The New York Times. 2018-05-29. ISSN 0362-4331. Retrieved 2018-05-29. ^ Kishore, Nishant; Marqués, Domingo; Mahmud, Ayesha; Kiang, Mathew V.; Rodriguez, Irmary; Fuller, Arlan; Ebner, Peggy; Sorensen, Cecilia; Racy, Fabio; Lemery, Jay; Maas, Leslie; Leaning, Jennifer; Irizarry, Rafael A.; Balsari, Satchit; Buckee, Caroline O. (29 May 2018). "Mortality in Puerto Rico after Hurricane Maria". New England Journal of Medicine. 379 (2): 162–170. doi:10.1056/nejmsa1803972. ISSN 0028-4793. PMID 29809109. ^ Donald J. Trump [@realDonaldTrump] (Sep 13, 2018). "3000 people did not die in the two hurricanes that hit Puerto Rico. When I left the Island, AFTER the storm had hit, they had anywhere from 6 to 18 deaths. As time went by it did not go up by much. Then, a long time later, they started to report really large numbers, like 3000 ..." (Tweet) – via Twitter. ^ "Trump rejects Puerto Rico storm death toll". BBC News. 2018-09-13. Retrieved 2018-09-13. ^ Erdman, Jonathan (20 October 2017). "Why Hurricane Maria Was Such a Catastrophe in Puerto Rico". The Weather Channel. Retrieved 23 October 2017. ^ a b Gambino, Lauren. "Donald Trump attacked for calling Hurricane Maria response an 'incredible success'". The Guardian. Retrieved 15 September 2018. ^ a b c Danny Vinik (27 Mar 2018). "How Trump favored Texas over Puerto Rico". Politico. ^ CNN, Kevin Liptak and Jeremy Diamond,. "Trump touts Puerto Rico response as 'fantastic' despite nearly 3,000 dead". CNN. Retrieved 2018-08-29. ^ a b c Mufson, Steven; Gillum, Jack; Davis, Aaron C.; Hernández, Arelis R. (2017-10-23). "Small Montana firm lands Puerto Rico's biggest contract to get the power back on". Washington Post. ISSN 0190-8286. Retrieved 2017-10-24. ^ a b "Investigation: Cruise start-up French America Line took customer money, didn't deliver". thenewsstar.com. Retrieved 2018-07-28.